Convair, previously Consolidated Vultee, was an American aircraft manufacturing company that later expanded into rockets and spacecraft. The company was formed in 1943 by the merger of Consolidated Aircraft and Vultee Aircraft. In 1953 it was purchased by General Dynamics, and operated as their Convair Division for most of its corporate history. Convair is best known for its military aircraft; it produced aircraft such as the Convair B-36 Peacemaker, the F-102 Delta Dagger, the F-106 Delta Dart, and the B-58 Hustler bombers. It also manufactured the first Atlas rockets, including the rockets that were used for the manned orbital flights of Project Mercury. The company's subsequent Atlas-Centaur design continued this success and derivatives of the design remain in use as of 2019. The company also entered the jet airliner business with its Convair 880 and Convair 990 designs. These were smaller than contemporary aircraft like the Boeing 707 and Douglas DC-8, but somewhat faster than either. This combination of features failed to find a profitable niche and the company exited the airliner design business. However, the manufacturing capability built up for these projects proved very profitable and the company became a major subcontractor for airliner fuselages. In 1994 most of the company's divisions were sold by General Dynamics to McDonnell Douglas and Lockheed, with the remaining components deactivated in 1996. The Consolidated Vultee Aircraft Corporation, whose name was in the course of time changed to Convair, was an American aircraft, rocket, and spacecraft company for the design, development, and manufacturing of aerospace products. It existed as a company from 1943 until 1994, although the Consolidated Aircraft company existed before that, and Consolidated produced important aircraft in the early years of World War II, especially the B-24 Liberator heavy bomber and the PBY Catalina seaplane for the U.S. Navy, the Royal Canadian Air Force, the British flying forces, and others. The Catalina remained in production through May 1945, and more than 4,000 were built. What was soon called "Convair" (first unofficially, and then officially), was created in 1943 by the merger of the Consolidated Aircraft Company and the Vultee Aircraft Company. This merger produced a large airplane company, ranked fourth among United States corporations by value of wartime production contracts, higher than the giants like Douglas Aircraft, Boeing, and Lockheed. Convair always had most of its research, design, and manufacturing operations in San Diego County of Southern California, and nearby counties, though other locations were involved as well. In March 1953, all of the Convair company was bought by the General Dynamics Corporation, a conglomerate of military and high-technology companies, and it became officially the Convair Division within General Dynamics. After the beginning of the Jet Age of military fighters and bombers, Convair was a pioneer of the delta-winged aircraft design, along with the French Dassault aircraft company, which designed and built the Mirage fighter planes. One of Convair's most famous products was the ten-engined Convair B-36 strategic bomber, burning four turbojets and turning six pusher propellers driven by Pratt & Whitney R-4360 Wasp Major radial piston engines. The Convair B-36 was the largest landbased piston engined bomber in the world. The Atlas missile, the F-102 Delta Dagger and F-106 Delta Dart delta-winged interceptors, and the delta-winged B-58 Hustler supersonic intercontinental nuclear bomber were all Convair products. For a period of time in the 1960s, Convair manufactured its own line of jet commercial airliners, the Convair 880 and Convair 990, but this did not turn out to be profitable. However, Convair found that it was profitable to be an aviation subcontractor and manufacture large subsections of airliners—such as fuselages—for the larger airliner companies, McDonnell Douglas, Boeing, and Lockheed. The Convair Division produced its own airplane designs, such as several airliners, until 1965, when it shifted from these to airframe/aerostructure subcontracting projects for other companies. 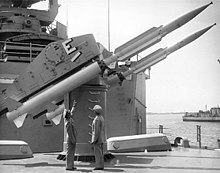 In the 1950s Convair shifted money and effort to its missile and rocket projects, producing the Terrier missile ship-launched surface-to-air system for the U.S. Navy during the 1960s and 1970s. Convair's Atlas rocket was originally developed in 1957 as an ICBM for the U.S. Air Force. It was replaced in 1962 by the room-temperature liquid-fueled Titan II missile and the solid-fueled Minuteman missile. The Atlas rocket transitioned into a civilian launch vehicle and was used for the first orbital manned U.S. space flights during Project Mercury in 1962 and 1963. The Atlas rocket became a very reliable booster for launching of satellites and continued to evolve, remaining in use into the 21st century, when combined with the Centaur upper stage to form the Atlas-Centaur rocket for launching geosynchronous communication satellites and space probes. The Centaur rocket was also designed, developed, and produced by Convair, and it was the first widely used outer space rocket to use the all-cryogenic fuel-oxidizer combination of liquid hydrogen and liquid oxygen. The use of this liquid hydrogen – liquid oxygen combination in the Centaur was an important direct precursor to the use of the same fuel-oxidizer combination in the Saturn S-II second stage and the Saturn S-IVB third stage of the gigantic Saturn V moon rocket of the Apollo project. The S-IVB had earlier also been used as the second stage of the smaller Saturn IB rocket, such as the one used to launch Apollo 7. The Centaur upper stage was first designed and developed for launching the Surveyor lunar landers, beginning in 1966, to augment the delta-V of the Atlas rockets and give them enough payload capability to deliver the required mass of the Surveyors to the Moon. 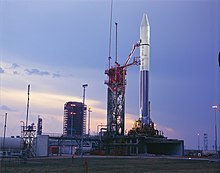 More than 100 Convair-produced Atlas-Centaur rockets (including those with their successor designations) were used to successfully launch over 100 satellites, and among their many other outer-space missions, they launched the Pioneer 10 and Pioneer 11 space probes, the first two to be launched on trajectories that carried them out of the Solar System. In addition to aircraft, missiles, and space vehicles, Convair developed the large Charactron vacuum tubes, a form of cathode ray tube (CRT) computer display with a shaped mask to form characters, and to give an example of a minor product, the CORDIC algorithms, which is widely used today to calculate trigonometric functions in calculators, field-programmable gate arrays, and other small electronic systems. General Dynamics announced the sale of the Missile Systems segment of Convair to Hughes Aircraft Company in May 1992 and the Space Segment to Lockheed Martin in 1994. In July 1994, General Dynamics and McDonnell Douglas mutually agreed to terminate Convair's contract to provide fuselages for the 300-seat MD-11 airliner. Manufacturing responsibility was to be transferred to McDonnell Douglas, which said it would not preserve the operation in San Diego. General Dynamics had tried for two years to sell the aircraft structures segment of Convair unit, but the effort ultimately failed. The termination of the contract meant the end of the Convair Division and of General Dynamics' presence in San Diego, as well as the city's long aircraft-building tradition. The defense contractor once employed 18,000 people there but after selling its missiles division to Hughes Aircraft in 1992, its Atlas rocket operation to Lockheed Martin earlier in 1994 and shutting down fuselage production in 1994, that number is now zero. General Dynamics closed its complex in Kearny Mesa, demolishing the facility between 1994 and 1996. Homes and offices now occupy the site. The Lindbergh Field plant that produced B-24s during WWII was also demolished and the consolidated rental car facility now occupies this space. The Fort Worth, Texas factory and its associated engineering locations and laboratories—all previously used to make hundreds of General Dynamics F-111 Aardvark fighter-bombers and F-16 Fighting Falcon fighters for the U.S. Air Force, along with dozens of smaller projects—were sold, along with all intellectual property and the legal rights to the products designed and built within, to the Lockheed Corporation. In 1996, General Dynamics deactivated all of the remaining legal entities of the Convair Division. 1939 Vultee Aircraft Division of AVCO reorganized as an independent company known as Vultee Aircraft, Inc. Note: U.S. Air Force and U.S. Navy aircraft designations that begin with "X" are merely experimental models of aircraft made only in small numbers. Military aircraft designations that begin with "Y" are developmental models made in small batches, which may or may not have subsequently entered large-scale production. In the former designation system that the Navy and the Marine Corps used, a final letter of "Y" identified a Convair or Consolidated product, such as the PBY-5 flying boat. Atlas-Centaur (1962) and its successor-designations, all of which combined an Atlas booster with a centaur upper stage – a civilian rocket to launch spacecraft to outer space. BGM-109 Tomahawk long-range, all-weather, subsonic cruise missile. ^ "General Dynamics Corporation". U.S. Centennial of Flight Commission. Archived from the original on 2008-11-12. Retrieved 2006-03-31. ^ "Charactron Tube". Computing at Chilton, of Atlas Computer Laboratory, Chilton. 2006-08-05. Retrieved 2006-10-22. ^ "Atlas to sell big block of Convair stock". Pittsburgh Post-Gazette. United Press. March 31, 1953. p. 17. ^ "General Dynamics, Vultee Directors Approve Merger". The Day. New London, CT. March 2, 1954. p. 15. Wegg, John (1990). General Dynamics Aircraft and their Predecessors. London: Putnam Aeronautical Books. ISBN 0-85177-833-X. Wikimedia Commons has media related to Convair.